NOTE : [AWPD] next to, or at the bottom of the page title means: “A Working Pictorial Document” = I’m not at all finished with it. NOTE : While this is a ‘WWW.COM’ listed web site, this site’s information is free to the public and was developed for educational purposes. If you use this resource for whatever reason, except those noted above, please reference www.steveonsteins.com. Thank you!! 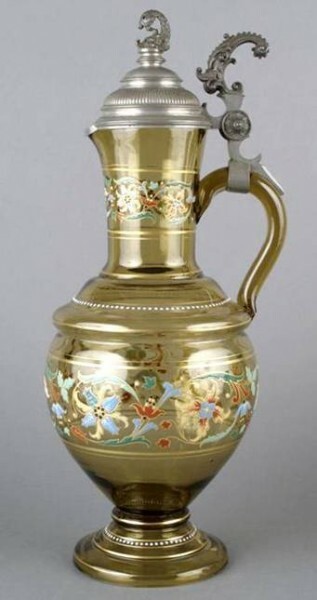 : ANY OF THE RECOMMENDED STEIN DEALERS / AUCTIONEERS AS LISTED ON MY “LINKS” PAGE. I just do not have the TIME OR INCLINATION TO APPRAISE a bunch of steins (I get about 5 to 10 requests every week !!! SOME PEOPLE OUT THERE MUST THINK CHRIS [@ “STEIN MARKS”] AND I DONT HAVE ANYTHING BETTER TO DO THAN TO DROP WHAT WE ARE DOING AND ANSWER THEIR QUESTIONS!! RE: BEER STEIN “VALUES” ► There are way too many variables ► their condition, location, the time of year, present trends in stein /drinking vessel collecting, local (and now national) economics; but by far, one of the “biggest problems of all in communicating “so called values” are the prior expectations by the owner[s]! (which are most usually based on hearsay and old, old rumors provide by family members or antique dealers who do not really know squat !! where and what for any one piece sold for. 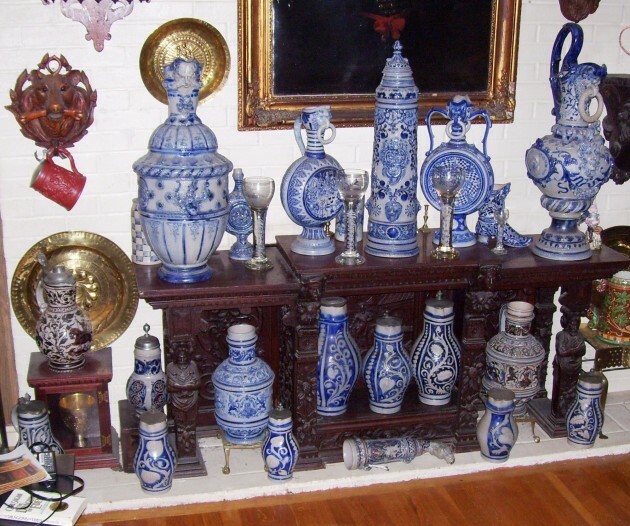 There is a vast difference between buying any given stein at a local auction, or an antique shop then buying the very same one from one of the national or international stein auctioneers!! Please remember, the major USA auction companies such as Soetheby’s OR Christies now charge over 22% (I think) just for “the privilege” of buying something from them! THAT CERTAINLY AFFECT THE VALUES. 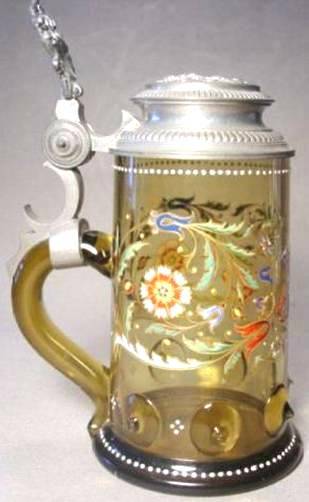 This web site was started as an informational site for beginning beer stein collectors that would be looking for the info and not the general public! This site does have its own search engine [top right on each page!] SO if one puts in “Wood Steins” or “PUZZEL MUGS,” it will give one a list of all the pages that should have that subject matter word within it. NOTE: I am sorry… but this feature is case sensitive (A “Word Press: feature, and not MINE !! ABOUT ANY INFORMATION ► THAT IS PUBLISHED ON THIS SITE? There will be a message forum added shortly. ANOTHER SPECIAL EDITOR’S NOTE: THIS WEB SITE IS SET UP USING A “WORD PRESS” PROGRAM ….ON A “FIREFOX SYSTEM.” WHEN PAGES ARE DISPLAYED USING ANOTHER PROGRAM THEY MAY HAVE LOTS OF BLANK SPACES AND ILLOGICAL PLACEMENT OF PHOTOS AND / OR MORE. I AM SORRY THAT THIS HAPPENS……. BUT THEN I JUST USE WHAT THE COMPUTER GIANTS SUPPLY US PEONS! A couple of more of my favorites by this firm: Two above ▲ ▲: 18 Inch tall Austrian Coat of Arms pokal. Thank you for your amazing work on your website. I am in awe and have learned so much and have acquired a new born amazement for beer steins etc. Who would have ever known there was such amazing variety. I do not know if you are still answering questions, but if you are I am hoping perhaps you can tell me your thoughts on the attached photo/pieces. 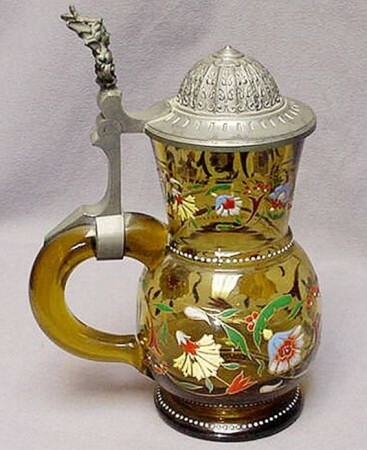 After looking at your Theresienthal and J. Lichtinger pages and looking at anything else I could find on the collaborations (the pewter work is inspiring) I began to think that my grandfather’s pitcher and glass holder (unfortunately this is the only surviving piece- there were 4 with the green glass inserts when I was growing up)might be the work of these two artists. Looking through all of your photos, I noticed things like the rose in the thumb lift and additional similarities in this section, the “c” handle, as well as the ribbing detail in the base and cap and of course the thumb molding in the glass. Judging from your work, I am guessing that the pieces date around 1890? I would be most grateful for any thoughts you might have. Well if I am not a dummy…I just found your Cranberry set of the Theresienthal/Lichtinger. It’s stunning. Makes me sad that all our glasses are gone. Thank you again for your site and all the beautiful pictures. What a wonderful site Stephen, thank you very much. I have searched for information about my father’s stein collection (he passed in 1960) and specifically about the one or two with these little crystal eyes that he used to like to show to folks. Two questions: 1. can I send you a couple of photos for more information? Steve, Just wanted to thank you for all the work you’ve done on giving us information and learning on steins, curiosity, and history. I have 130+ steins myself and love knowing the things you put out there for us. Thank you for all that you do! After hours of research, I was finally able to identify 2 mysterious copper “jars” that I found in Gettysburg, PA! Thank you for all of the information that you have made available! I couldn’t have figured it out without your website! I am attaching a picture, as I still can not find any others quite like them. I thought you may appreciate taking a look. 4-4-2013 = A $3,700.00 mistake averted!! Sorry to here about ………………………….” I have watched a few of the items at Gary Kirsner. To up date you on the Rock Island auction. My adult son, who also read your postings and I both took these in at the viewing and every thing you say about looking for a fake was then evident. 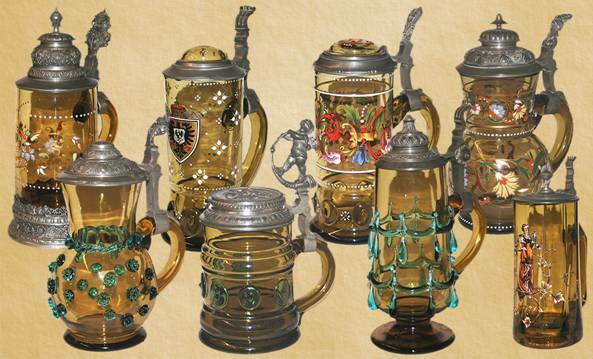 Obviously i did not bid, but did check the price afterwards the 6 steins as a group went for around $3700. Unbelievable that was more than i would have though even if they had been real. Appreciate your series of three articles on repro regimental steins. You confirmed for me that there are some high quality repros on the market now from Germany. I was shocked by the quality of the KB IR 23 stein in part 3 (new repro number 4). That stein looked real. I have been a serious collector of regimental steins for six years and enjoy a small set of about 38 original steins. My Christmas present was a beautiful ceramic naval stein (SMS Deutschland). Like most, I learned the hard way how to identify real from repro. While 99% of repros are now easy to identify, I’ve noticed some high quality repros the past two years – that one percent. While the body of the stein looks real with all the usual characteristics, the generally poor quality lid gives them away. Just saw a high quality ceramic naval stein for 1,200 euro on the German eBay this past weekend – the lid was exceptionally high quality, but the base gave it away as I saw the same base design on obvious repro stein. Anyway, thank you for publishing your series on the Internet. Thank you for the good information on glass bottom mugs. My wife was at Gadsby’s Tavern in Alexandria yesterday where she was told glass bottoms were there to let the tavern keeper know when you were almost out of beer. Seemed odd to me since you can tell that by how far back someone has to tip their mug anyhow. Steve, Thank You, Thank You, Thank You! I can not express the joy in my heart at having stumbled onto your stein website. I was researching a medical device at work when I found your site and emailed the link to my home. I have been a collector myself for over half a century. As a youngster growing up in South Texas i began an ever widening search for Civil War items. That was in the 1960s. 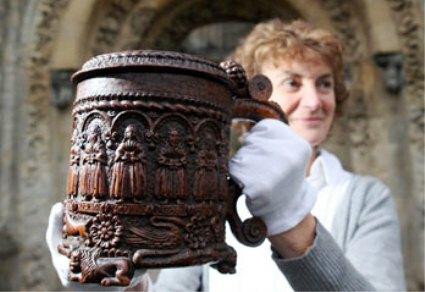 I often ran across beer steins in my search but knew that I could only afford to collect one subject at a time. 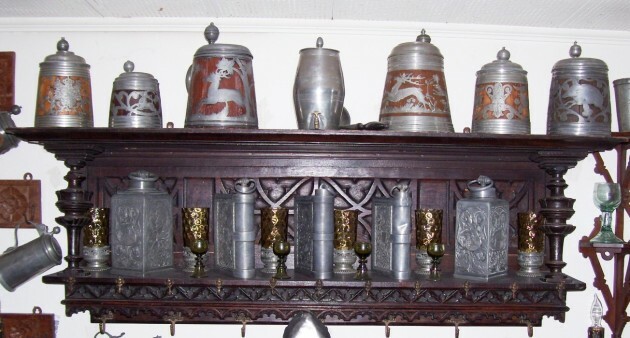 I resisted the urge to collect steins, all the while gaining an appreciation for them, until about 15 years ago. I don’t buy many because of the expense. I joined the SCI about 10 or 12 years ago but my job made it impossible to make a meeting. I joined the Lone Star Chapter and made on meeting but I only vaguely remember it. I was working from 5pm until 5am and was almost too tired to navigate. Seems there was some kind of friction in the club at the time because someone came out and looked at what I brought for display and said “Well at least their old!” and went back into the house. It was an interesting experience. I have always been interested in the story behind the item. I read a lot and try to understand the context in history that something was used in. I’ve never written much for publication, never went to college. Collecting anything today is getting difficult with so many “investor groups” pushing prices up and the vest pocket dealers getting dumber and dumber. …………………………………………. I’ll be back to your site often. I may even put my 2 cents worth in. I own a few wooden steins, a couple of drinking horns (real ones) a much a art nouveau steins, and a hodge podge of others. Sincerely & Have A Safe & Happy Holiday Season. I wanted to thank you – Back in 2011 I sent you an email asking for your help on a stein I wanted to buy my husband off eBay. My husband was stationed in Germany during his Army service and really enjoyed learning about the steins while he was there. I bought the one you looked at for me – We love it! I couldn’t get back with you because his mother took ill, my husband had to quit work to take care of her and I took over the bills for both homes. (So, I was a bit busy and too tired for the internet) Things have settled down a bit – we got her on her feet and healthy as can be for an 81 year old. 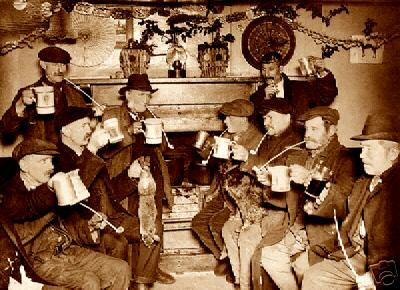 We have since kept your website as our go to when we want to research steins. 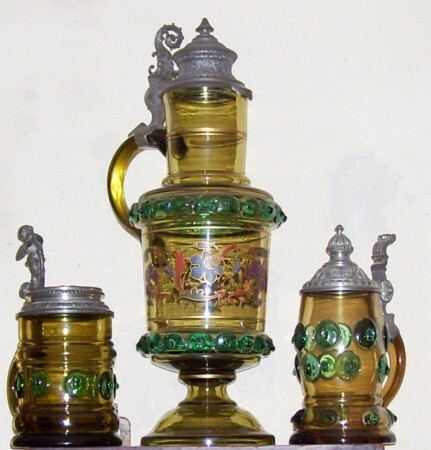 We now have 4 regimental steins – we are pretty sure one is not real after being on your site extensively, but for $60 I had to have it (from an antique store) because it is still so beautiful. So, Steve, in a nutshell – we appreciate you – we appreciate the time you have put in to your website – we have learned so much because of you. We always look at each other and say, “let’s go to Steve on Steins Website and see what he says.” We have enjoyed your site for the past few years now – you have helped this couple in Indiana to be more knowledgeable on steins.